[SatNews] FTI securely connects more than 4,300 national and international FAA and DoD facilities, manages over 26,000 services, and supports more than 50,000 users. Harris Corporation (NYSE:HRS) has been awarded a seven-year, $331 million contract to provide highly reliable air/ground data communications services for a key Federal Aviation Administration (FAA) program. The contract has 10 one-year options that could extend the duration of the program to 2029. 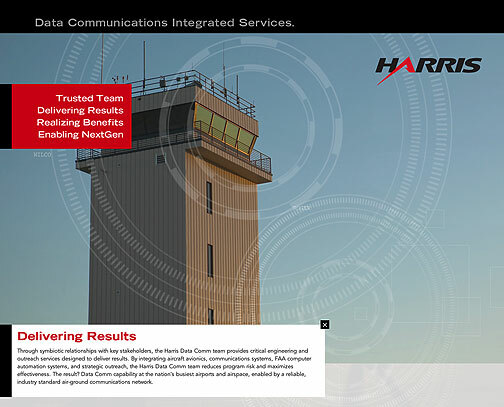 Under the Data Communications Integrated Services (DCIS) contract, Harris and its teammates will provide integration and engineering services for the end-to-end DataComm system, including management and delivery of data communications services leveraging commercial air-to-ground digital data link networks to connect FAA air traffic control (ATC) sites and data communications-equipped aircraft. Harris will also establish an outreach initiative to encourage and incentivize aircraft operators to equip their aircraft with DataComm-compatible avionics. DCIS is a key component of the FAA’s DataComm program, which ultimately will automate many of today’s routine ATC and en route voice communications with specialized data messaging equivalents. The goal of DataComm is to ensure more reliable ATC communications; enable trajectory-based routing; and improve arrival and departure routes – saving fuel and reducing emissions. DataComm is an essential element of the FAA’s Next Generation Air Transport System initiative to transform the U.S. air traffic control system to meet future requirements. The Harris DCIS team includes leading aviation and communications innovators with extensive experience and advanced labs/facilities: Adfero Group, American Airlines, ARINC, The Brattle Group, CGH, EES, Egis Avia, GE, HCRQ, NATS, Sunhillo, Thales and Washington Consulting Group. The Alaskan Satellite Telecommunications Infrastructure program, which provides voice and data communications between the Alaskan Air Route Traffic Control Center in Anchorage and 64 regional FAA sites. [SatNews] The nation is acquiring the radios to provide security forces with high-performance line-of-sight and beyond-line-of-sight tactical communications. Harris Corporation (NYSE:HRS) received a $7.2 million order to supply a nation in the Middle East with Falcon III® RF-7800S Secure Personal Radios and Falcon II® high-frequency manpack radios. The nation is acquiring the radios to provide security forces with high-performance line-of-sight and beyond-line-of-sight tactical communications. The Falcon III RF-7800S is a lightweight body-worn tactical radio that provides full-duplex voice and data communications over two kilometers. Optimized for maximum performance across highly variable environments, the RF-7800S secure personal role radio provides continuous coverage in the 350 to 450 MHz frequency range. The radio offers dual push-to-talk capabilities and allows simultaneous communication for voice, data and video. The Falcon II RF-5800H-MP provides beyond line-of-sight voice and data communications. The RF-5800H provides continuous coverage in the 1.6 to 60 MHz frequency band, enabling the warfighter to stay connected even in the harshest conditions, when line-of-sight communications are not an option. It offers advanced features such as Third Generation-Automatic Link Establishment, integrated data link protocols and embedded GPS receivers. 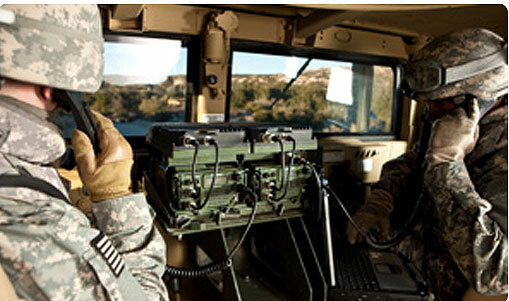 Harris RF Communications supplies secure radio communications and embedded high-grade encryption solutions for military, government and commercial organizations. The company's Falcon® family of software-defined tactical radio systems encompasses manpack, handheld and vehicular applications. Falcon III is the next generation of radios supporting the U.S. military's Joint Tactical Radio System (JTRS) requirements, as well as network-centric operations worldwide. Harris RF Communications is also a leading supplier of assured communications® systems and equipment for public safety, utility and transportation markets—with products ranging from the most advanced IP voice and data networks to portable and mobile single- and multiband radios.